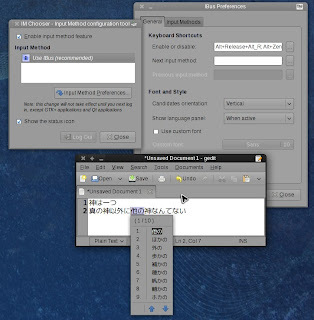 The Input Method Editor used in Fedora before, SCIM, have been replaced with IBus. Which offers better stability. The long awaited Presto feature finally hit the main repos in Fedora 11. Its not enabled enabled by default yet, but setting it up now is as easy as yum install yum-presto. No more 3rd party temporary presto repos, its all in main repos now :D.
Other enhancements includes, EXT4 file system as default FS,Python2.6, Xserver 1.6 and many others. Some annoyance I faced so far are related to Xorg on my old i855GM card. The screen messed up when launching compiz in dual screen mode. So, no compiz for me again for this moment. Another Xorg annoyance with my card is Xvideo. When Kernel Mode Setting is enabled, XVideo fails with "No Adapter" error. But if I disable KMS, XVideo is detected, but crashes Xorg when trying to play a video. So, I had to fallback to X11 output, which is resource intensive. Bug already reported related to Xvideo, lets hope later driver pushes fixes this. Xorg related issues is common to me when upgrading to newer Xorg, so its kindof expected here. Overall, Leonidas roars!!. Once the driver for my card fixed, it gonna ROAR more :D.
is this the preview disk with no updates from rawhide? The failing disk error could be bogus. I ran into a similar error but on closer inspection its faulty information from my harddrive firmware being reported to smart. Erm, what I wrote above are mainly after update to rawhide. Except perhaps plymouth, which broke on the new kernel. about the disk, I haven't checked into details yet, not familiar with the tools. But anyway, this machine is already way too old (4yrs+), so I pretty much expecting this.